Beautifully designed new construction luxury townhomes situated on a quiet tree-lined street in the historic Prairie District. Exceptional attention to detail throughout with 3431 square feet of living space and extra wide floor plans. The foyer entry boasts heated marble floors with unique herringbone pattern. The oversized living area has large windows, sleek molding and beautiful hardwood floors throughout. The separate dining area flows seamlessly into the gourmet kitchen, an excellent space for entertaining. Custom white cabinetry, huge eat-in island wrapped in quartz, chic brass pendants and hardware, and high-end stainless steel appliances. Master suite with walk-in-closet and spa-like bath featuring heated floors, dual sinks, and glass enclosed rain shower with body sprays. The top floor family or media room is the perfect space to relax with a full wet bar and slider doors to the private rooftop deck. Custom closet organizers throughout. Oversized attached two-car garage. Beautifully renovated Marshall Field Jr. Mansion condo. This historical landmark building situated on Prairie Avenue, commonly known as Millionaires Row, was once home to some of the country's wealthiest entrepreneurs and their families. The preserved brick facade is complemented by a landscaped garden. 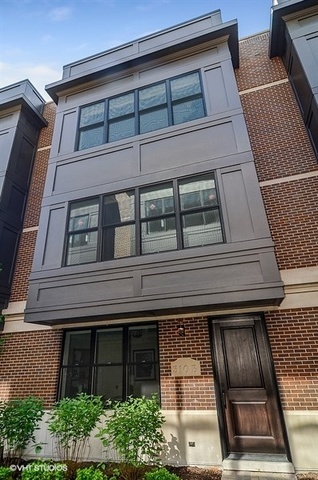 3 BR 21/2 bath unit w/ over 3,200sf in one of Chicago's most significant boutique buildings. Expansive windows, soaring ceilings, and hardwood floors throughout. The unique layout offers a spacious formal living area w/ French doors and gas FP. Formal dining room w/ butlers pantry and wine cooler. The combined kitchen and family room create a one of a kind space to gather w/ oversized bay window and FP. Chefs kitchen has Viking gas range, eat-in island, granite, and chic pendant lights. The master suite is a relaxing escape w/ sitting area, FP, WIC, and spa-like w/ bath dual sink vanity, steam shower w/ body sprays and rain shower. One garage parking space and one exterior space included. Beautiful Central Station town home situated on the historic tree-lined Prairie Avenue. Rare corner unit with four bedrooms, two and a half bathrooms and over 3,200 square feet of living space. Gated front entry with private patio garden. Oversized formal living room with fireplace is filled with natural light from the unique curved wall of windows. Separate formal dining room with hardwood floors throughout. Large kitchen with breakfast area features granite countertops, plenty of cabinet space, an eat-in island, and views overlooking the courtyard. Comfortable family room area on first level. Sprawling master suite features a walk-in-closet and master bath with dual sink vanity, soaking tub, and separate glass enclosed shower. Spacious bedrooms with ample closet space. Private rooftop deck, overlooking the courtyard. Attached 2-car garage, private gated community. Desirable South Loop location near Grant Park, the lakefront, Museum Campus, and many wonderful shops and restaurants.